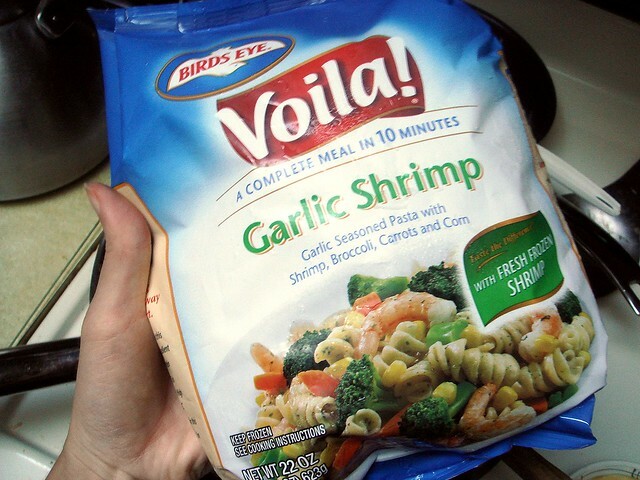 Through Foodbuzz' Tastemaker Program, I'm reviewing Bird's Eye Voila frozen dinner. I receive a coupon to purchase a bag for free, and also received buy one get one coupons to pass around. You may find it odd that a food blogger who cooks from scratch would even consider reviewing a frozen dinner. Well, they aren't all bad. There are brands that use real ingredients instead of the overly processed, and are similar to meals you'd cook at home. This, however, was not one of those. I honestly wanted to find something I liked about it, and perhaps one of the other flavors would have been better. Unfortunately, I don't have much to say for Garlic Shrimp. It says that it's a full mean, but there is only about 1 cup of cooked pasta to be split amongst 3.5 servings. The garlic butter sauce seemed a bit like the topping on frozen garlic bread. The addition corn was ridiculous since it's so cheap, and I felt as if that's the only reason it was added. For the price (about $6 a bag), it's not a value. It's not very filling and the ingredients aren't good enough to make the purchase worthwhile. Since I needed to enhance it, I chopped up some additional garlic, bell peppers, and onions to saute. I added spices before I added the frozen mixture. Besides not having much pasta, there was even less shrimp. Another disappointment. 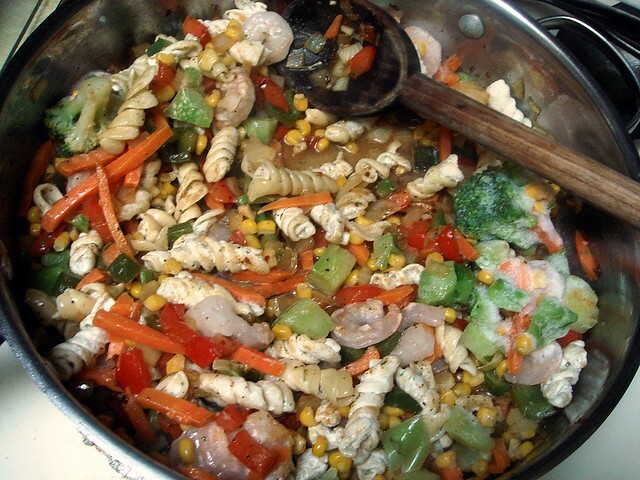 After cooking the contents according to the direction, I fished out all the pasta and added a can of coconut milk. 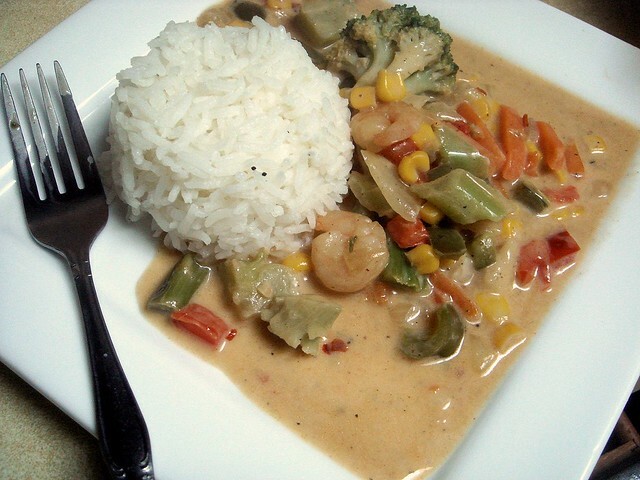 I then mixed a little of the milk with corn starch to thicken the sauce, serving alongside rice. This was much more filling than had I eaten the meal on its own. I don't like writing negative reviews. I try and select products I feel will benefit you all to learn about, but sadly that wasn't the case today. I'm really lackluster about this, seeing as it was simply a bag of mixed frozen vegetables with a bit of pasta and shrimp tossed in (which you can replicate for less yourself), and I know I won't be buying it again in the future. 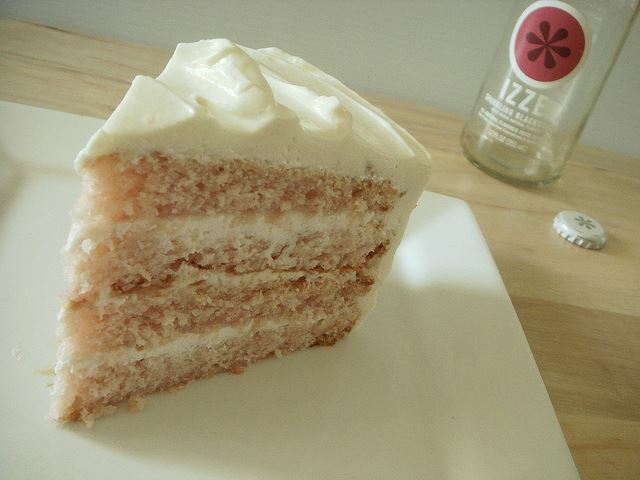 A few weeks ago, I was contacted by an IZZE representative about reviewing the IZZE juices. Being familiar with IZZE juices, I took her up on the offer. 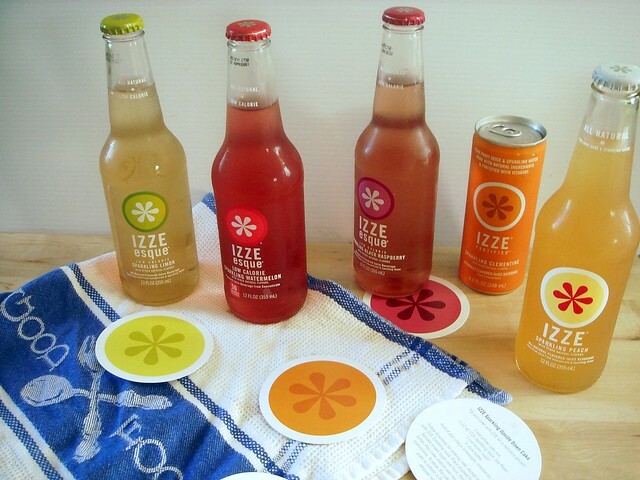 They sent me a generous package filled with 6 different varieties, from their regular line, their IZZE-esque line (a lower calorie juice), IZZE Fortified, sparkling juice enhanced with vitamins. 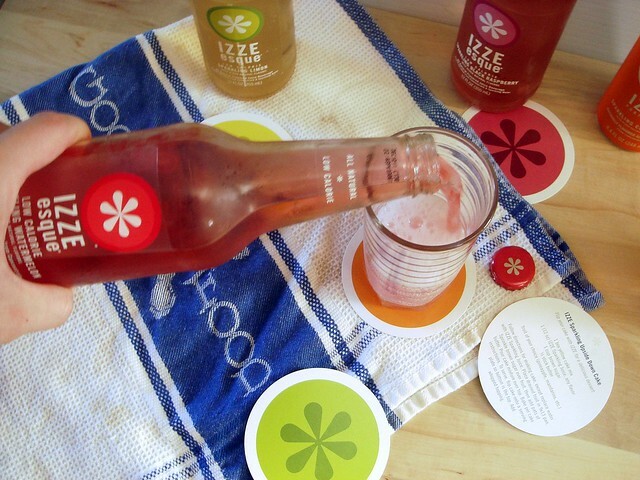 IZZE was started by two friends who wanted to create a natural version of the European sodas they tried, and since then IZZE has become a company whose goal is to create a product that is not only good for you, but good for the world. They've partnered with the Global Education Fund to improve the lives of children living in poverty through education. It's cool to learn of a company who uses what they have to help others. You can learn more about their work at IZZE, Giving Back. Their commitment to excellence is evident by the ingredient label. Each juice is made up of a 70% pure fruit juice to 30% sparkling water ratio, with no added refined sugar. There are 29 grams of sugar per bottle, all from the fruit juices. The IZZE Esque, the light version, has just 11 grams of sugar, though the fruit juice is reduced to 25%. I liked how they didn't use any type of sugar substitute, natural or artificial. The flavor is lighter in comparison to the regular IZZE, but I liked it just the same. IZZE is available in a wide range of flavors. Besides berries and melons, you can find ginger and birch! 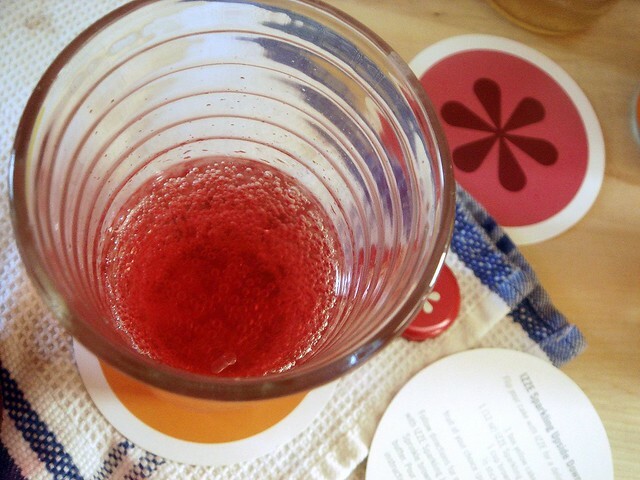 In tomorrow's post, I will feature a recipe made from the IZZE Sparkling Blackberry. Along with the juices, they sent me a booklet that had a view recipe cards, so I wanted to use the juices in that application instead of simply reviewing the products. 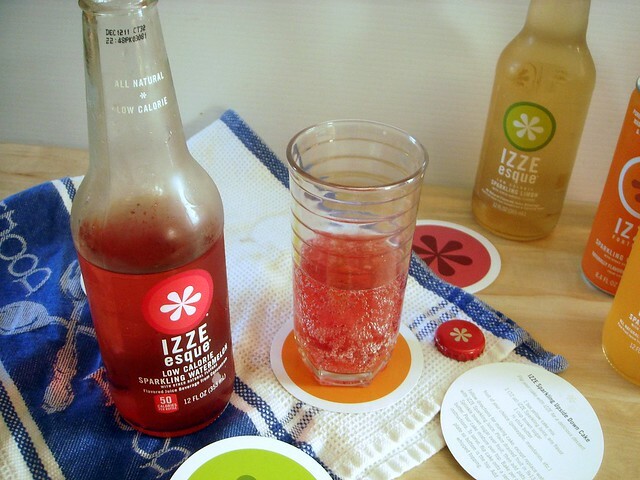 Thanks again to IZZE for your generosity in giving me the opportunity to review your products on my blog. I always wear my headphones if I am at the gym! Congratulations, Meg! She blogs over at Fashionable Runner. Please email me your shipping info at christinaATrunningfoodieDOTcom. Thanks to everyone who entered, and thanks to Zippearz for hosting! I know, I know, I've been a bit crazy with the reviews lately (this may or may not be the last of them for a little bit). 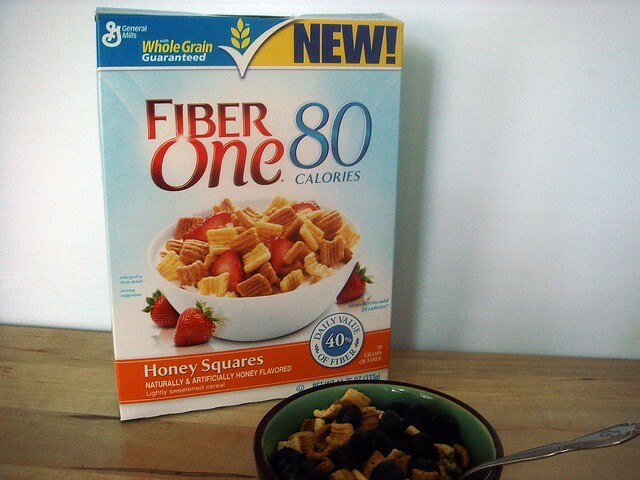 I don't normally review what I would call "diet foods", but when given the opportunity to review Fiber One's new 80 Calorie Honey Squares cereal, I took the offer so that I can highlight some issues I feel needs to be addressed in concerns to diet food. First, though, let me review the cereal. 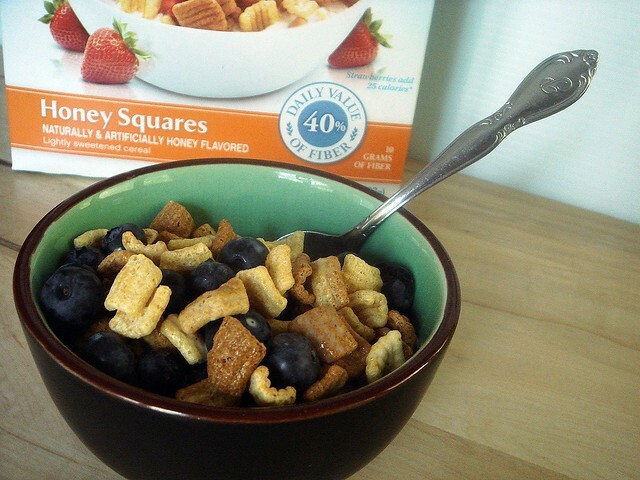 Fiber One 80 Calorie Honey Squares cereal features lightly sweetened wheat and corn puffs. They're like the grown up version of Captain Crunch, but obviously with better ingredients. Fiber One cereals contain 10 grams of both soluble and insoluble fiber, or 40% of the Daily Value of fiber per serving. Since it contains both forms of fiber, it packs a double punch in terms of helping to keep you satiated, as well as offering more health benefits. The cereal, which tastes like pancakes, has a crispy crunch and a light texture. Another interesting ingredient I haven't seen used as often is inulin, a starchy substance that's naturally occurring in many plants. It has many different health benefits, and since inulin isn't easily absorbed by the body it doesn't affect blood sugar the way other foods might, making it a good choice for diabetics who need to keep blood sugar illnesses at bay. The sugar content comes it at a low 3 grams per serving, though that is due in part to sucralose. I'm not a fan of artificial sweeteners because of the after taste they leave, and in general I'm opposed to replacing sugar with sugar substitutes because it could possibly keep us from balancing those foods out due to the lower calories. 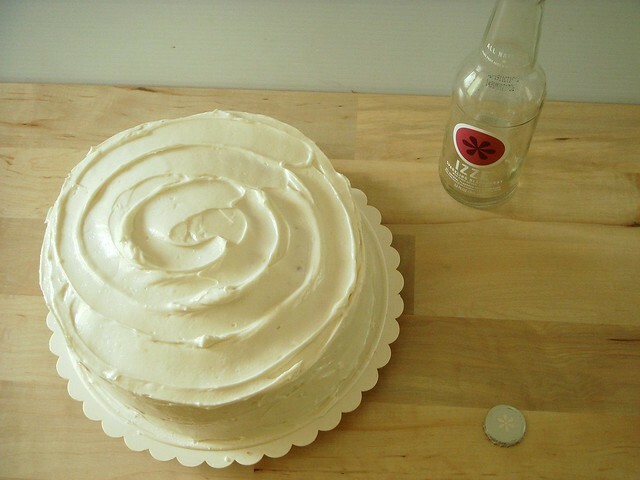 Just because a cookie or cake has 75 less calories because of a sugar substitute, doesn't mean we need to eat it everyday. 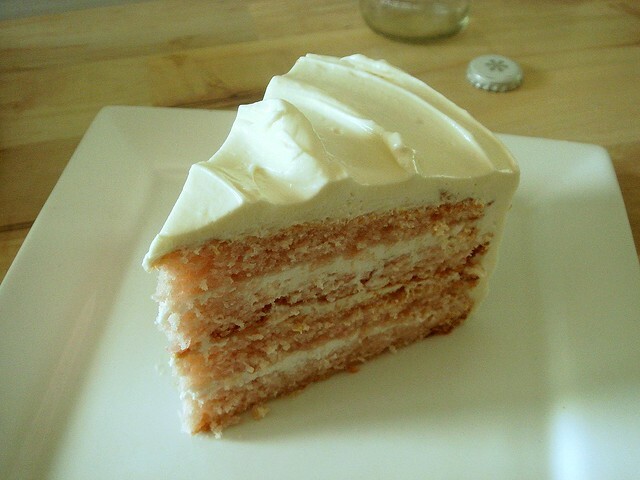 I also think it tastes too sweet and makes me crave more sugary foods in general. Coming in at a mere 80 calories per serving, not including milk or any fruit added, it really is a light cereal. The price tag is a bit steep, $4.49 a box, though many cereals these days are around that price. Fiber One 80 Calorie Honey Squares can be found in major grocery stores nationwide. Now, not pertaining to this product in particular, my issue with "diet" foods is that it gives us an unhealthy perspective on everyday eating. We really don't need special foods to lose weight or shape up, although they are convenient. It's important to learn how to tailor normal foods to fit into our lifestyle, which is how we'll be able to stick to our goal long-term. If we solely rely on weight loss products, we'll never be able to gain a strong foundation for healthy eating with regular, everyday items. Every now and again, these products are beneficial, but I make it a habit in my life not to rely on powders and supplements. Instead, I strive to eat a balanced diet that works well for my needs. I'm constantly having to adapt, though it's all in the name of learning. If I were trying to lose weight, cereal alone wouldn't do a good job of keeping me full. I last longer when I've had some protein, and I think that's true in general for most people. Maybe my body burns through fiber and carbs quickly, I don't know. If you'd like to try out the cereal for yourself, enter to win a box, and an armband with a pedometer. 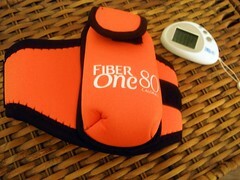 Fiber One is trying to help keep you moving, and a pedometer is a good way to track how many steps you take. Set up is simple and you can import data to your computer. The armband can fit a small phone, or your pedometer. Leave a comment and let me know what your healthy breakfast is. Leave a comment on Fiber One's Facebook page, posting I entered @She Runs, She Eats giveaway for Fiber One 80 Calorie Cereal at http://bit.ly/p9w4gr for an additional entry. Leave a second comment to let me know. Contest ends Saturday, August 6 at noon, and is open to US residents. 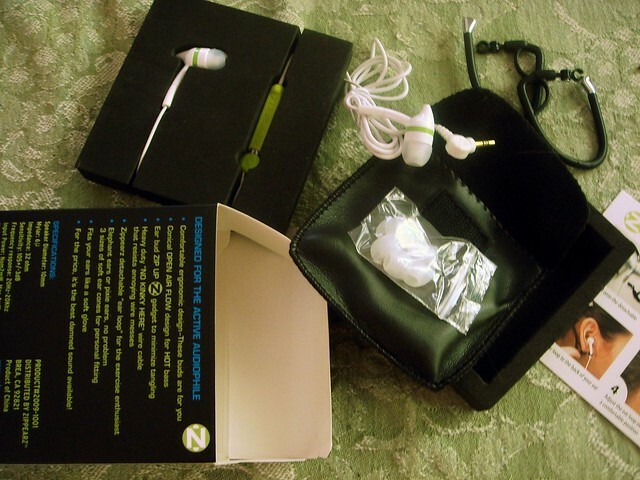 The ZippEarz folks sent me a pair of their earbuds to review and giveaway. They also gave me a hoodie that can be used along with the earbuds, and although it was a nice hoodie it was too big, so I gave it to my brother. ZippEarz earbuds feature a 10mm speaker diameter, a conical fit (resting almost inside the ear canal vs resting in your ear like Apple earbuds), 3 sizes of soft ear cones for a perfect fit, detachable and adjustable ear loops to keep your ZippEarz in place during exercise, and a "zipper" feature to manage the cord. At first, I wasn't sure how well these would work for me. 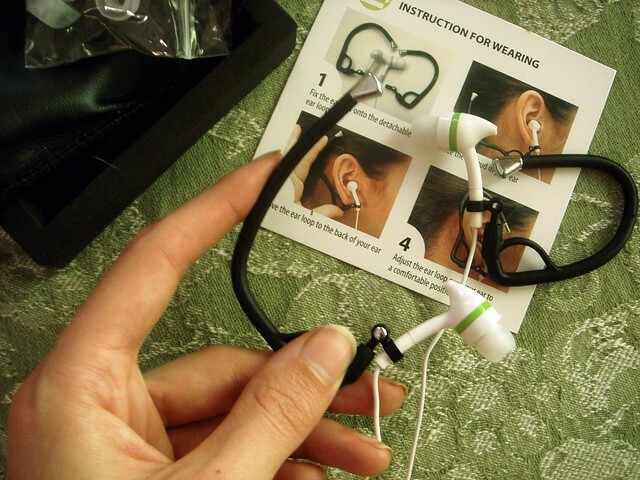 The earbuds I use rest inside the ear instead of going deeper into the ear canal, so I didn't know how I'd like the fit and the fact that the sound would be a little more intense. 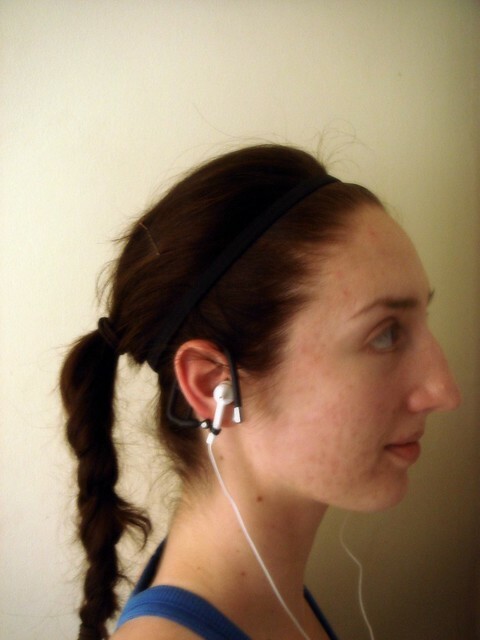 To begin, I fitted the earbuds with the smallest ear cones. I don't think my ears are very big, though perhaps the next size up would help keep them in place better. I attached and adjusted the ear loops, then put them on. This wasn't easy; I needed to look in the mirror to see what I was doing since I had a hard time getting the loops to fit snugly over my ears. The cord on the ZippEarz features a zipper to keep the cord from tangling. This is a really nice feature, as sometimes I forget to take my necklace off, resulting in a massive knot with the cord of my regular earbuds that I have to figure out post run. While the cord may seem long, the benefit is that everyone regardless of height can wear it. I didn't want to run with excess cord flying around, so I tucked it under the waistband of my shorts and headed out for a run. Unfortunately, my braid knocked off one of the ear loops. Once it fell off, I couldn't get it back on. For the first half mile it stayed in place, though. The sound was a little intense so I lowered the volume much more than I would with my regular earbuds. Had it not been for the braid incident, I think the earbuds would have stayed in place, but I'd have to try it again to be sure. The pros for me: Despite the above, inconclusive incident, the sound quality is good. 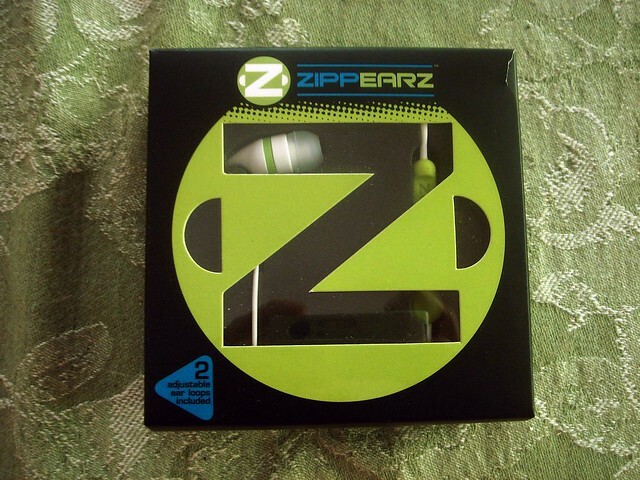 ZippEarz retail for $24.95 a pair and come in 3 colors (they sent me green, which works out nicely as its my favorite color!). For the price, you get good sound and a lot of extras, like the loops. I don't expect inexpensive earbuds or headphones to have the greatest sound, but when they do it's a nice surprise. Update: After listening to tunes with Zippearz for the past few months, I've come to the conclusion that the sound quality is great. The music sounds deep, I can hear notes I never picked up as deeply with my standard Apple earbuds (cheap piece of crap). So if you're looking for quality with a good price, these are it. The zipper feature is pretty neat. 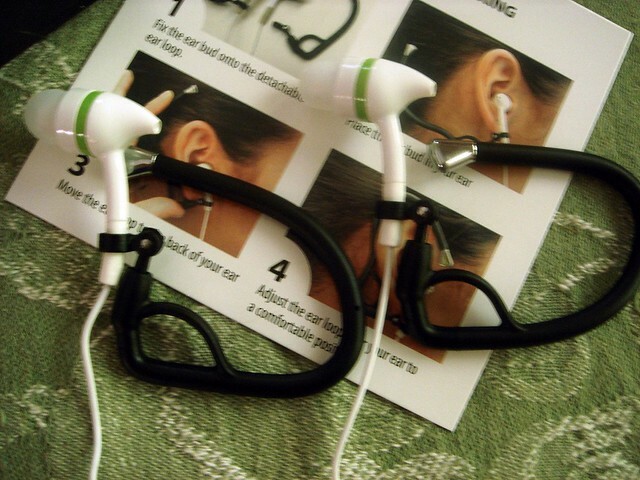 It keeps the cord near your neck together so it won't tangle or fly around. I'm still unsure about the fit. I have stayed away from conical style earbuds because they push further into the ear. 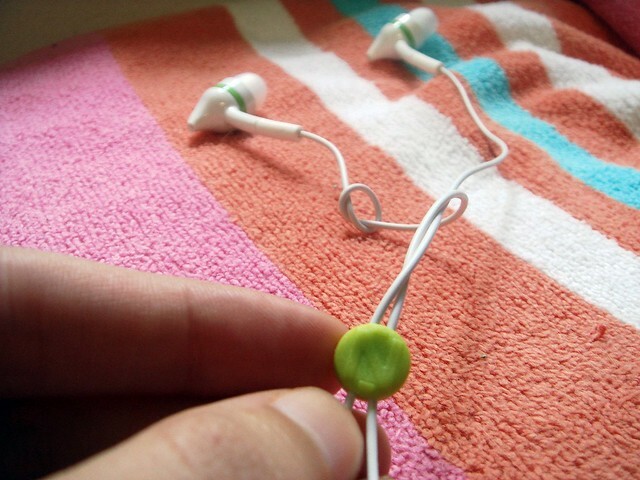 After listening to music with these for a little bit , the sound became more annoying earlier. In doses, I'd find these to work great, and they aren't uncomfortable to wear. Second Update: I've been able to wear these earbuds while running without the attachable ear pieces by pushing the conical buds deep into my ear. This means I have to turn the volume down even lower than usual, but that's probably for the best. Unfortunately, one of the cords somehow is partially sliced in half and that earbud went out. Luckily, my sweetie pie bought me a new pair. That's how much I've come to like these earbuds. Would you like to win a pair of ZippEarz? Enter for a chance to win! You'll get a pair of ZippEarz, a pouch, 3 sizes of soft ear cones, and ear loops. The value is $24.95. Leave a comment. Tell me when you're most likely to listen to music - while you workout, during your commute, cooking in the kitchen? 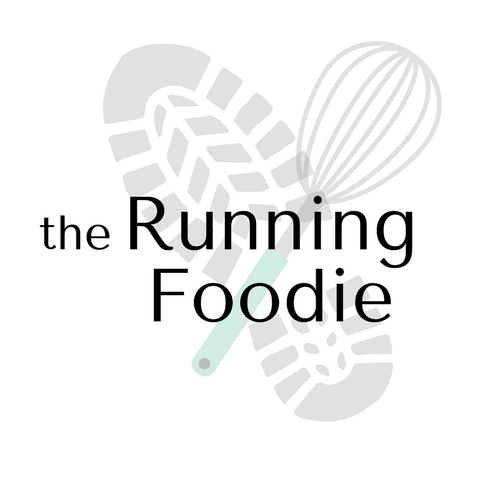 For an additional entry, Tweet the following: Win a pair of @zippearz from @RunningFoodie http://bit.ly/qsSspM. Leave a comment letting me know. Blog about this giveaway, linking back to this post. Include the link in your next comment. Giveaway ends Friday, August 5, at noon. Good luck!